This series of articles was originally written for UKC, offering information and insight into different aspects of training. In this blogpost, Tom talks about strength and power; why it matters, how to train strength and power respectively, and how to structure your training. Find the original UKC article here. Climbers all over the world have been searching out the ability to increase their strength and power for decades. We associate them with the highest levels of performance and “limit” climbing, but what are they and why do they matter? Strength is commonly defined as the ability to exert force against resistance (whether that’s your own bodyweight or against an object) and in the simplest sense, it should be considered the maximal force applied in a single contraction. This of course leads to lots of questions about how you measure it, how long you measure it for and what muscles are most specific to climbing performance. Power, on the other hand, is a slightly more complex facet of muscle performance as it includes a time component. Unlike strength, it measures the velocity component of a muscle contraction (and joint angle change) and therefore high power levels are a function of both force and speed. Interestingly, the relationship between strength and velocity is one that means maximal power is seen at approximately one third of max strength and also one third of max speed. Cool huh?! What does this mean for you as a climber though? Climbing at a very high intensity is often limited by the ability of the forearm to maintain a static grip position (hands not opening out). If you have high finger strength, then the forearm is able to resist high forces threatening to open grip positions. Your ability to exert power will be affected by the level of strength that you show. Also, if you have low power levels but high strength, you may well feel great on static/slow movements, but struggle on dynamic sequences. It should be noted that this is highly simplified as skill levels can also greatly affect this. 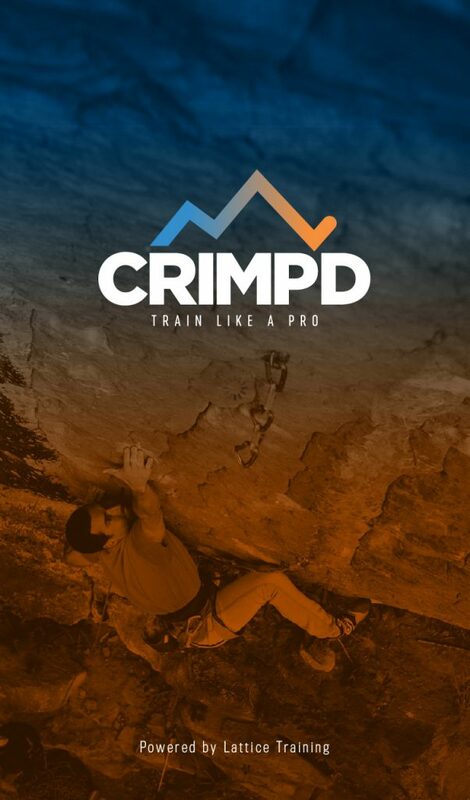 In the Crimpd app, we’ve broken strength and power into bouldering, finger strength and power sessions to give you options for training. 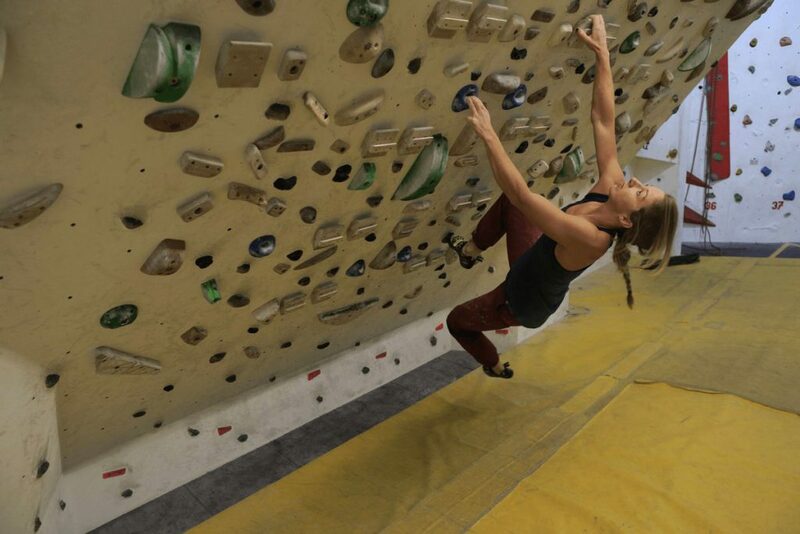 The strength training is comprised of interval bouldering or finger boarding and the power work is completed via limit bouldering or campusing (when appropriate). The aim with these sessions is to increase your ability on maximal moves, use worse holds in climbing sessions and climb more powerful sequences. Note on campusing: we strongly recommend that campus exercises are used by adults only. We see the greatest benefits in more advanced adult climbers and any intermediate climber wishing to try these methods should seek the advice of someone they trust. In almost all circumstances, juniors should stay well away from a campus board for multiple reasons. 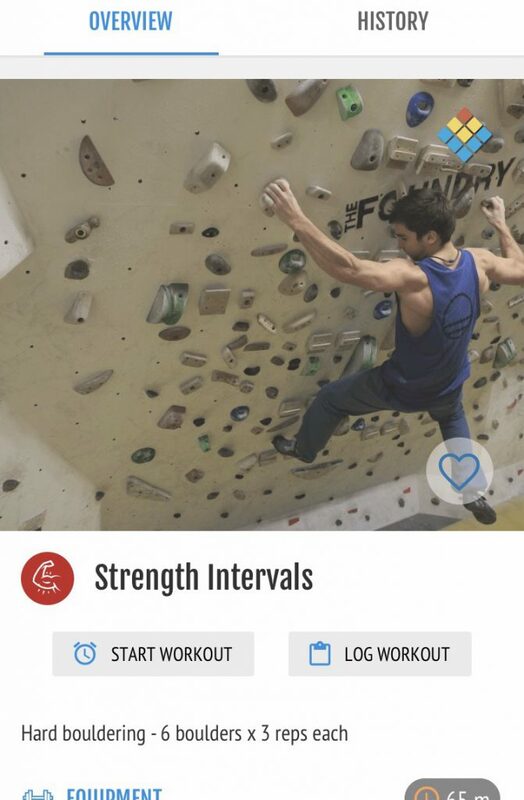 Let’s take an example workout from the app, which is Strength Intervals. This session is one that sets the climber the task of climbing 3 reps of 6 different boulder problems. The intensity is set at 1-2 grades under your maximum boulder grade. The grade must be close to your maximum grade to make gains in strength and therefore you should train when fresh. Aim for “basic” style problems so that you’re not tempted to “trick” your way around difficulties. For all strength sessions, it’s important that form is good throughout and that session quality is high. If you suffer loss of either, stop for the day and make some adjustments for your next session. Firstly, it should be noted that power sessions will often have both a strength and power stimulus to them and your primary focus should be to identify what muscle group you’re trying to develop power in. For example, a campus session may develop finger “strength” but upper body “power” during the session. The focus of power workouts is to ensure that there is a heavy speed element to the training protocols and that the session is relatively short. It’s also extremely important that power workouts are completed when fresh and well warmed up and never at the end of sessions. 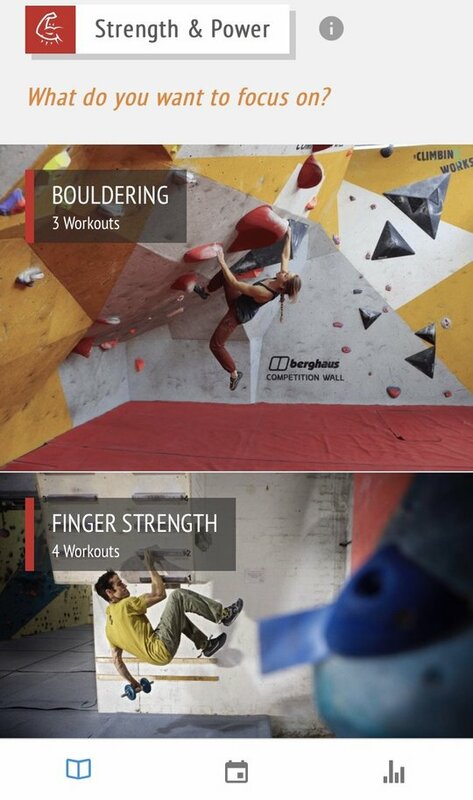 An example of this would be a session found in the app called “Boulder Campus” which can be performed on a bouldering wall, whether it’s a normal section of the climbing gym or a system board. 4 sets of 3 reps.
Grade is 5-6 grades below your maximum – if it’s at your maximum you’ll find it very hard to include a significant speed element! The grade must be a moderate bouldering grade for you and feature holds that are comfortable in size and shape. You should aim to feel “powered out” by the end of the session and failure is only occurring in the last few reps, if at all. Aim to create big moves which feel within your comfort zone when testing the problems. These two forms of training are beneficial to both boulderers and route climbers, but timing of strength and power should be separated depending on your training cycles. Both route climbers and boulders should focus on strength training during “base” periods of their training seasons as this form of training takes the longest to make adaptations, but also has a significant effect on power training later on. Power training is then used as a method for getting into peak physical shape for a goal and should be introduced 2-6 weeks beforehand (depending on the athlete and training history). One point to note, is that power training has a significant skill element to it, so if you’re a climber who has long-term lacked power, it may be an element of your training you wish to look at more regularly. As a very rough guide, we would expect both boulderers and route climbers to do only two sessions of their respective form of strength or power training per week and anyone considering more should speak to a coach or a trusted individual. This training is easy to over-do! Strength training will increase your maximal force (of the muscle trained) and improve the capacity of that muscle to subsequently exhibit high power levels. Power training is used to improve force applied at speed in the upper-body and forearms. Exactly the same methods can be applied to the lower body. 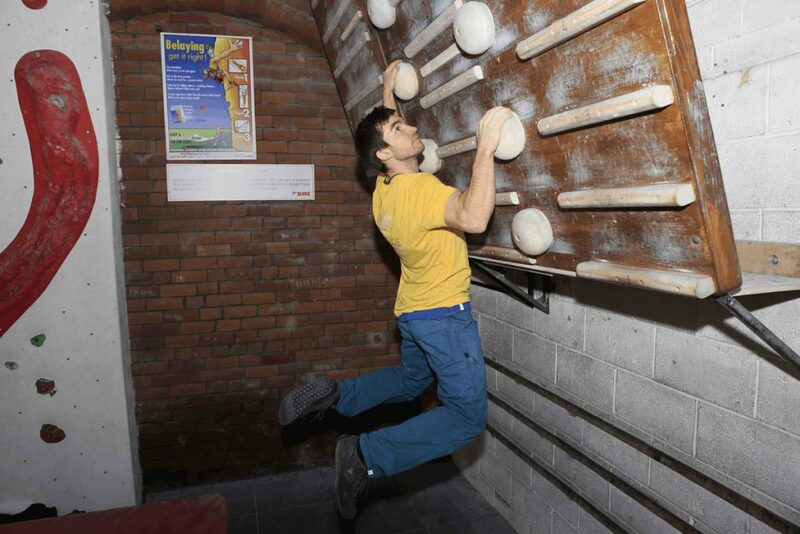 Power training is a protocol that brings about peak physical form in route climbers and boulderers.